We’d love your help. Let us know what’s wrong with this preview of The Official Preppy Handbook by Lisa Birnbach. To ask other readers questions about The Official Preppy Handbook, please sign up. I read this in eighth grade with the complete understanding that it was satire and nevertheless I adopted it as biblical word -- and not a moment too soon, as the following year I headed into four years at a preparatory, co-ed Catholic high school that did away with uniforms and instead implemented a very picky dress code, the subtext of which was to look as rich as possible, while also achieving a winning sense of casual confidence. Which put me right on the front lines of the Great Midwestern I read this in eighth grade with the complete understanding that it was satire and nevertheless I adopted it as biblical word -- and not a moment too soon, as the following year I headed into four years at a preparatory, co-ed Catholic high school that did away with uniforms and instead implemented a very picky dress code, the subtext of which was to look as rich as possible, while also achieving a winning sense of casual confidence. Which put me right on the front lines of the Great Midwestern Preppy Wars (1981-85), in which people died (or felt like they were going to) over things like Moonlight Madness sales at Harold's, gorgeous cotton v-neck tennis sweaters, argyle socks, Lacoste vs. Ralph Lauren, Duck Head khakis, starched boat collars, pearls (in ninth grade, ladies! ), boat shoes (nowhere near salt water), Weejuns, Ray-Ban vs. Vuarnet, etc. If I said I hated this phase of my life, you should call me a liar. The real takeaway from this book about true preppiness -- the point most people missed -- was this: Preppiness is thriftiness. The best preppy stuff is a little dinged-up, dented, frayed. It's not about neat and clean. It's about well-used and still handsome, solid, pretty. All those movies in which the preppy is the fastidious bad guy with the cable-knit sweater loosely knotted around his neck just got the whole feel of it WRONG. Preppiness is still your surest safeguard against TRENDINESS and fashion-victimhood. I don't know when I first got my hands on this book, though I can't remember life without it. This handbook was my crack during those all-too-awkward pre-teen years. To this day I'm sure my overwhelming knowledge of East Coast boarding schools circa 1984 is disconcerting for those to whom it is somehow revealed, but you give an unbelievably gifted and imaginative ten-year-old girl copies of The Catcher and the Rye, A Separate Peace, and the Preppy Handbook and dare her not to dream. I'm proud of I don't know when I first got my hands on this book, though I can't remember life without it. This handbook was my crack during those all-too-awkward pre-teen years. To this day I'm sure my overwhelming knowledge of East Coast boarding schools circa 1984 is disconcerting for those to whom it is somehow revealed, but you give an unbelievably gifted and imaginative ten-year-old girl copies of The Catcher and the Rye, A Separate Peace, and the Preppy Handbook and dare her not to dream. I'm proud of my past of wearing coulottes, headbands, argyle socks and Topsiders. I loved my knickers and wish I still had a pair. This book encouraged me to imagine a life away from my own, where liquor cabinets were posh, boys were named Chip and Trip, furniture had heritage, and dogs were part of the family. And it's not like this came from nowhere. Hell, my childhood nickname was Kiki and I took tennis lessons. I still own an LL Bean fisherman's sweater and could probably find a pair of Weejuns, albeit badly worn, if pressed. I think half my socks are argyle. I was raised by laissez-faire parents who enjoyed a monogram as much as the next guy. I still own multiple boat and totes! So you see, these dreams weren't born in a vaccuum. I just took them to the next level. Totally useful for those who either live in New England, or ever want to visit there. Or just want a good giggle. What can I say. I think this book may have been meant as a joke but to some of us in the mid 80s it was a Handbook on how to dress, talk, and act. I'm embarrassed to admit it but I used to quote from it and we used it to settle arguments on what was proper and what wasn't. Read minutely in high school, internalized to such an extent that, upon re-reading it, I am shocked to learn that the values I thought I picked up from trying to be a cool punk rocker (nonchalance, consistency, effortlessness) were instead absorbed from this book, along with detailed advice about what sports to take up (lacrosse, crew), and how many layers to wear on the ski slope (at least five). Absolutely seminal - presaged the Dorling Kindersley all-sidebars-and-captions layout; influenced t Read minutely in high school, internalized to such an extent that, upon re-reading it, I am shocked to learn that the values I thought I picked up from trying to be a cool punk rocker (nonchalance, consistency, effortlessness) were instead absorbed from this book, along with detailed advice about what sports to take up (lacrosse, crew), and how many layers to wear on the ski slope (at least five). Absolutely seminal - presaged the Dorling Kindersley all-sidebars-and-captions layout; influenced the style, content, and layout of Vanity Fair magazine; looks a lot like the Internet does today. A prep is typically a well-educated, good-looking person who comes from a solid, well-established, "old-money" family. Most preppies have been preppy since birth; have attended private/boarding schools all of their lives; enjoy sophisticated, lifelong sports such as (but not restricted to) tennis, sailing, skiing, and golf. The term is commonly associated with the Ivy League and oldest universities in the Northeast, since traditionally a primary goal in attending a prep school was admittance into one of these institutions. Preppy also refers to a conservative, timeless style of dress and the simple choices of classic jewelry. I absolutely adore this style. It is a great example of how to be fashionable and classically stylish together. 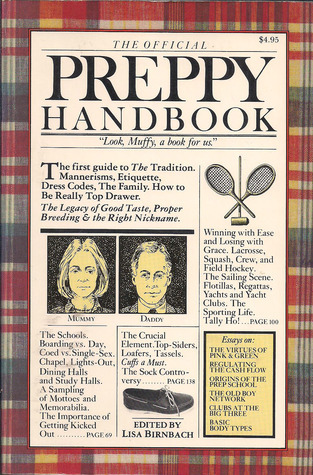 Overall, The Official Preppy Hanbook is a humor reference guide. It doesn't have an actual story-line, instead it reveals the inner details of the elite preppy culture. A quick and enjoyable read. This is one of my favorite books. It's a shame that it is out of print! It's the definitive commentary on 80s preppy culture. I laugh at the way the preppy lifestyle has evolved into what it is today, with A&F apparel being considered "preppy." That just wouldn't float in The Official Preppy Handbook! I subscribe to the culture and mannerisms of the old preppy definition, not the new faux one today. It's hilarious but it's not wrong either. A fantastic spoof of 90s prep that is also 70s to 2000s because preppy recycles and never dies. My husband picked it up and quickly became engrossed. Includes clothing suggestions, vocabulary, a diagram of the good old boys network -- in effect, everything you need to be preppy from cradle to grave. I bought this book back when it was first published; I was young and impressionable and soaked it up like a sponge. I recently picked this book up and read it again. I realized, from the perspective of 30 years later, how much this book influenced me. I need to buy a new kilt for my daughter because she has now outgrown the one I bought her when she was 3 (what practical garments they are, no other item from her wardrobe at age 3 still fits her now at almost 7) and told her that she can't get her I bought this book back when it was first published; I was young and impressionable and soaked it up like a sponge. I recently picked this book up and read it again. I realized, from the perspective of 30 years later, how much this book influenced me. I need to buy a new kilt for my daughter because she has now outgrown the one I bought her when she was 3 (what practical garments they are, no other item from her wardrobe at age 3 still fits her now at almost 7) and told her that she can't get her ears pierced until she is 16. I have done online searches of local training facilities that offer riding lessons in hopes that she will soon enter her horsey phase (which I have never outgrown and am really looking forward to shopping for a pony). I own an old house (historic restoration is such a rewarding hobby) and have priced documented William Morris wallpapers and haunted the second hand furniture stores and auctions (for those items that look like they've been in the family forever). I garden. My job title is one the list of acceptable prep careers. Although my dogs were not specifically mentioned as an acceptable breed, they are rather rare, (meaning that none of the rednecks around here would ever own these dogs) esoteric and I have 3 of them, which counts as a pack.....always desirable. The car I drive is preppy and it is a preppy color. I originally read my dad's copy of this when I was in high school, and remembering that picked this up when I spotted it in one of my local used book stores. Considering this is from the early 1980s, it's worn pretty well. Why? Well one, because Abercrombie & Fitch got revived in the interim (though its prep cred is nothing like it used to be) and two, because prep style is somewhat eternal and unchanging. Most of what I could relate to here as a teenager was pretty much the same elements I I originally read my dad's copy of this when I was in high school, and remembering that picked this up when I spotted it in one of my local used book stores. Considering this is from the early 1980s, it's worn pretty well. Why? Well one, because Abercrombie & Fitch got revived in the interim (though its prep cred is nothing like it used to be) and two, because prep style is somewhat eternal and unchanging. Most of what I could relate to here as a teenager was pretty much the same elements I could relate to now -- the importance of nicknames, the right schools, pink and green, and Lilly shift dresses come summer. That said, if you aren't from Connecticut, didn't go to private school, and/or are unfamiliar with the Orvis catalog, you probably won't find this book funny -- it'll just seem bizarre and tedious. However, if you answered "yes" to any of the above, you'll at bare minimum get a chuckle or two out of this (but probably more). Re-reading this also reminded me -- yes, the early 00s Hipster Handbook is more or less a knockoff of this book, but someone needs to re-do that one, now that hipsterdom has proven itself, like prepdom, to persist throughout the entire lifestyle. The original Hipster Handbook claims hipsters disdain children, but anyone who's been to Brooklyn (or some parts of lower Manhattan) in the last five years can testify that that is not the case. I don't know that all the stuff about schools would work as well but-- no wait, jokes about Pratt vs RISD, going to state schools ironically, okay yep, those chapters would work too. I can't say it better than Hank Stuever's review, and I won't begin to try. This was my DAHS Class of '84 Bible. Doubt it? The Senior photo is worth 1000 words. My treasured copy drifted from my grasp somewhere along those many moves--gone but never forgotten--and my teen daughters kindled a desire to visit those hallowed halls of preppydom. Thank-you, Betterworldbooks.com. Whose hands once studies these pages, I wonder? Did you also discover the joys of the monthly mail order catalog? I feel lik I can't say it better than Hank Stuever's review, and I won't begin to try. This was my DAHS Class of '84 Bible. Doubt it? The Senior photo is worth 1000 words. My treasured copy drifted from my grasp somewhere along those many moves--gone but never forgotten--and my teen daughters kindled a desire to visit those hallowed halls of preppydom. This is a book of a very specific cultural moment. I forget this sometimes then try to force chinese students to think it's funny like I do. This book will be perpetually funny to anyone that went/goes to prep school or knows old money. Hopefully, you have the distinct pleasure that I have of both being true. You would like to think that some of this stuff would change after over thirty years, but they really haven't. The stereotypes in this book are dead-on. It is consistent throughout and a very accurate portrayal of those who live in New England. Not a lot has changed in the 30 years since this was first published. Fun book at the time for those who wanted to decode what Muffy and Biff were thinking, wearing and saying. I can't really judge its authenticity, but it was definitely an interesting read. Defined a moment that is still with us in repercussions. Very funny, very New England. Meant to be satire, but I once treated it quite literally as a handbook. The Prep value system is a hybrid of the Puritan ethic and noblesse oblige combined in an unspoken code that is, nevertheless, as solid as the rock on Mummy's engagement ring. . . These values are second nature - like wearing loafers without socks. I discovered the existence of this masterpiece the summer after high school. It was 2007 and a slew of indie bands formed by intelligent college grads was popping up in every corner of the internet. One of them in particular, Vampi I love this handbook! I discovered the existence of this masterpiece the summer after high school. It was 2007 and a slew of indie bands formed by intelligent college grads was popping up in every corner of the internet. One of them in particular, Vampire Weekend, became an obsession for me. Therefore, I did what every seventeen year old does, I ravaged the internet to discover everything I could about the band. That's when I came across Ezra Koenig's blog and his mention of this book in the comments section of a post properly titled "PREP-osterous". About a third of the way through this book, one of my children woke up in the middle of the night and climbed into our bed, covered in vomit. I found myself wondering if a preppie ever had to deal with that kind of experience - one to take care of a sick kid, two to change everyone's bedsheets in the middle of the night. Luckily I was not doing it alone. I realized that thought this book is very funny, it had also dehumanized a group of people I already didn't particularly care for, so I decided About a third of the way through this book, one of my children woke up in the middle of the night and climbed into our bed, covered in vomit. I found myself wondering if a preppie ever had to deal with that kind of experience - one to take care of a sick kid, two to change everyone's bedsheets in the middle of the night. Luckily I was not doing it alone. Blatant satire mixed with hilariously accurate truths. I've seen this book around for years and finally bought an old used copy this year. If you've ever thought of yourself as "preppy" or had family with even an ounce of "yuppie" in their nature *slowly raises hand* then you have to at least skim this book, if for nothing else than a good laugh at your own expense. Bonus points if you read it while wearing boat shoes and have a carved duck decoy anywhere in your house. A fun, highly readable satire that can easily be read as part guide, part prep Bible. Its pages detail the life of a prep from childhood to old age, and are very accurate in its observations and descriptions. 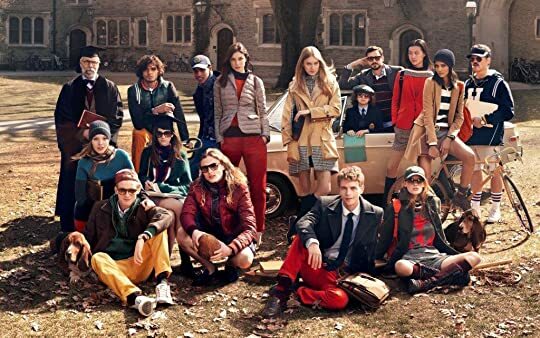 Prep school and the College years are perhaps the most fleshed out, and the section attire--while very 80s--has not changed much and is now undergoing a Renaissance of sorts in the 21st century. This is an excellent, hilarious take on one of the most visible undercurrents of society. I had this book in high school - back when it was actually a little bit funny and relevant. I just ran across a copy of it the other day and it jogged my memory. Obviously it's a satire, but I remember at the time it was given to me that I didn't think it was that great. Maybe too over the top for a rural mid-western teen. Maybe it was funnier if you lived on the east or west coast at the time. I understood all the references, just didn't think they were THAT funny. Liked the satire behind it, even though many of the "preppy" elements are still en vogue today. Some parts of the book are seriously outdated (some of the prep schools mentioned are now coed, for instance; some of the stores and restaurants mentioned are out of business), but as a New England resident, I found myself relating to some of the points this book made. I still miss my Eastlands and Tretorns. Since I spent half my childhood in DE in the 1980s, this book was nostalgic for me. It was in DE that I first encountered preppy style. Having gone to public school, I'm convinced now that I did not actually meet any true Preps, since the true Preps go to elite private schools. I liked that the book was informative but tongue-in-cheek. I don't know how anyone not born into a Prep household becomes one, but perhaps that is the point. That you can't.